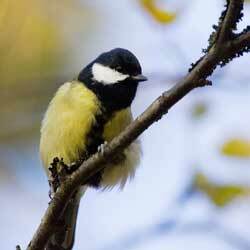 One of the benefits of a garden is the wildlife it attracts, and birds are some of the most popular garden wildlife. Most birds are voracious eaters that are glad to keep the insect population down, and may eat 500-1,000 insects in one afternoon. This makes them ideal for natural (and free!) pest control. Anything you can do to attract birds will make your garden healthier and you’ll be entertained by their feeding antics along the way. Fortunately, it is easy to attract birds to your garden if you meet their needs for food, shelter, water and overall habitat variety. While birds will certainly eat insects and may munch on seeds, berries and fruits in the garden, consider placing a variety of bird feeders in your garden to entice even more birds to visit. Platform feeders attract ground birds, hanging feeders are for perching birds and suet holders attract insect-eating birds. Suet is especially important during the winter as this helps birds maintain their body temperature by adding fat to their diet. Hang plastic mesh bags of suet or pinecones dipped in suet (or peanut butter) from the limbs of trees. For your other feathered guests, white millet and black oil sunflower seeds will attract the most common seed-eating birds and can be sprinkled directly on the ground or added to feeders. Add other species-specific seed like Nyjer (thistle) seed (to attract goldfinches, pine siskins and purple finches) or peanuts (to attract chickadees, jays and tufted titmice) to your buffet. Various gourmet seed mixes are also available like Lyric Supreme, Delight, Chickadee, Woodpecker and Finch Mixes, each of which is blended with specific birds in mind and includes the foods those birds like best. Birds feel more secure if they have shelter to protect themselves from the weather and other predators. Plant native trees and shrubs birds will easily recognize as suitable shelter. If your landscape is young and doesn’t include much shelter for birds, don’t worry. Consider building a brush pile or adding a loose woodpile to the yard and birds will happily take advantage of it. You may also want to add nesting boxes or bird houses and other materials for birds to raise their young. This should be done in late winter or early spring just as birds are beginning to look for nesting sites. Clean houses or boxes after each nesting season. One of the most important things to include in your bird-friendly garden is water. This is especially true during the winter months. Use a bird bath heater to keep water from freezing. Ideal water sources are 2-3 inches deep and 3 feet off the ground to keep visiting birds safer from prowling predators. Moving water is a magnet for most birds and will attract them from great distances for a drink or bath. A mister, dripper or circulating pump can be added to a bird bath or other water feature during most of the year, but take care to winterize the equipment properly so it does not freeze and break during the coldest months. Because birds live in many different habitats, the variety of plant material you can offer in your backyard will determine how many birds are attracted to your garden. Consider native plants, plants with berries, fruits, sap and nectar for year-round food sources as well as nesting materials. Plan your landscape in tiers and flowing, connected beds so birds can move around easily, and include a variety of both deciduous and evergreen plantings so birds can find the habitat useful year-round. We carry a complete line of bird feeders, houses, seed mixes and suets as well as garden accents; all the accessories and plants you will need to start attracting birds to your backyard. Stop by today!